Retailers You may purchase multiple copies at a discount! Contact us for a resellers promo code to use with this link. When Good People Get Bad News …they can either get scared and crawl under a rock or step up and become proactive; which is exactly what Barbara Baxter did when she learned she had cancer. As she negotiated the emotions that were sparked by the rather one dimensional way typical western medicine was helping her, Barbara started collecting her own ways of coping she started calling her Sugar Pills. She reached out to the people around her and began collecting their advice, sage words and inspired ways of dealing with difficulties. 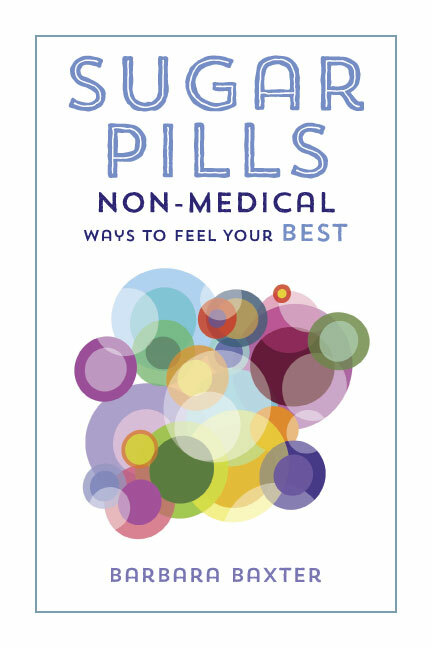 As she compiled this information she soon realized she had enough to fill a book, and thus “Sugar Pills: Non-Medical Ways to Feel Your Best” was begun in earnest. Each topic is explored from various points of view depicting a variety of ways successful people have successfully changed their lives for the better as they, too, coped with trying times and difficult situation. 356 Pages • Perfect Bound • Full Color Cover • Photos, sketches, recipes and more! “What a great journey and how beautifully you captured it.” –Gene.